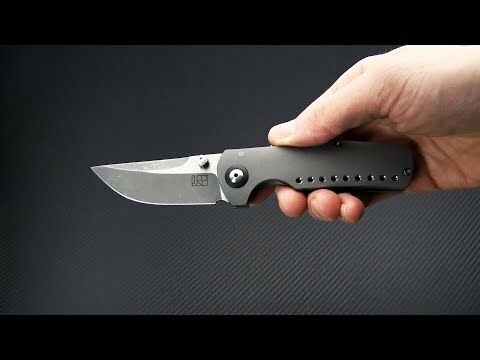 The Jared Price Custom Egret is a hand built, compact, tank of a folder with a low-profile aesthetic and exceptional fit and finish. This Egret does not waiver from Jared's low-key style with a matte gray, blasted titanium handle and two-tone, satin and acid stonewashed, finished CPM-154 blade. Coming in right at 7 inches overall, this custom can ride comfortably as an EDC or fit right into any collection. Brand new, directly from Jared Price. Made in the USA. Blade: Quick to action, the CPM154 stainless blade is easily accessed via the dual, custom titanium thumb studs deploying with fluid speed thanks to the caged ball bearings. The blade grinds are gorgeous with with a straight spine, big belly profile highlighted with a three-quarter length top swedge and deep hollow grind, both is acid stonewash finish and bright satin flats for contrast. JRP custom makers mark adorns the front side of blade. Handle: Contoured titanium slabs form the handle with polished front divots for accent. Bead-blasted for a matte gray appearance, the handles are secured together via a torx construction and feature a black G10 backspacer and matching pivot collar details. Finished with satin titanium hardware, a hidden lanyard pin sits inline with the spine. A blasted, 3D machined titanium clip is set up for right hand, tip-up only carry. Pouch: Includes soft sided nylon zipper pouch.